Looking for fun costumes and party favors? We have a great deal value pack made especially for you! kilofly Pixelated Gamer Geek Sunglasses are the most trendy costume props for adults and kids on group photoshoots, carnivals, theme parks, travels, etc. They have UV protected lens, making them perfect for everyday use as it protects your skin from the sun's intense heat. Make your birthdays and other occasions more memorable by giving away nice looking sunglasses as party favors. Definitely something cool for everyone to wear! 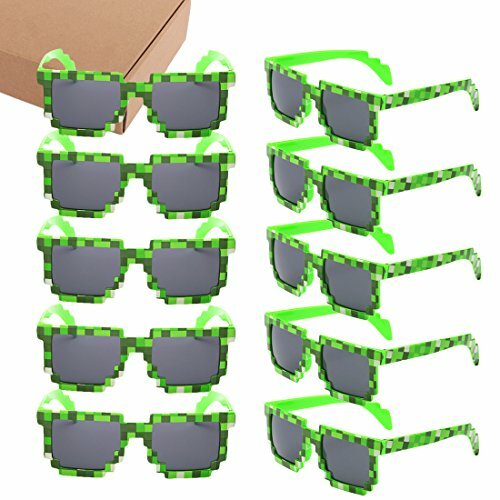 This value pack includes 10 pixelated designed sunglasses as shown in images. Fun-Sized Value Pack - Can be nice costume props for adults and kids on group photoshoots, carnivals, theme parks, travels, etc.